When we last left off, Himea had just evolved into horny Himea (happens all the time). She introduces herself as Rapture and that she is one of Himea’s spells. Meanwhile, Gekkou is conversing with what seems to be the two voices that were talking with Haruka in the last episode. 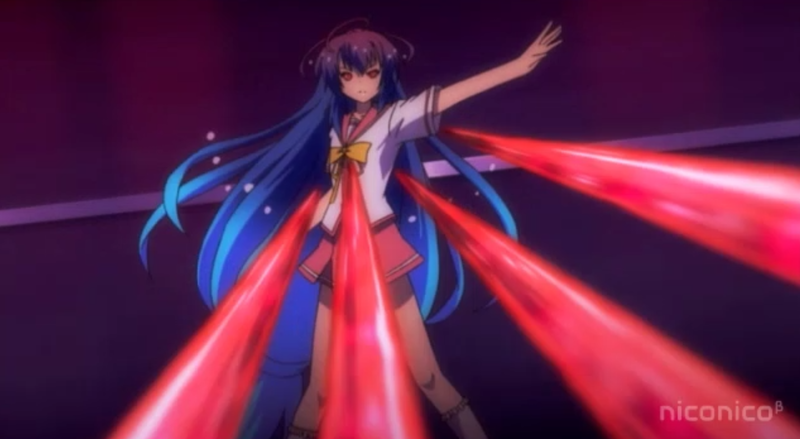 They show him a vision of the school, which prompts Mirai to attack, but the attack is repelled and she gets owned. The voices reveal themselves to be Seraphim and tell Gekkou about a prophecy. 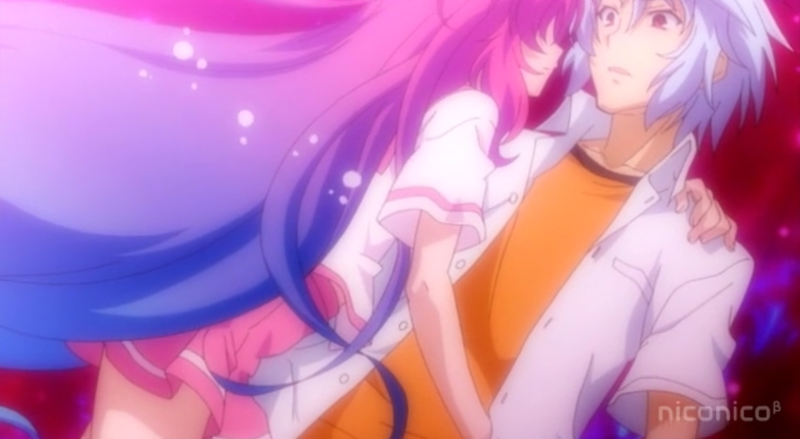 Meanwhile, the Rapture spell is making her move on Taito. Taito demands that she allow Himea to return, but she refuses, revealing that Himea had been jealous of Haruka. The Seraphim are telling Gekkou that they will give him the power to kill Himea, but Gekkou refuses to do it. However, they predict that he will return to ask for the power. Gekkou realizes that they are only using him because they are unable to do so, so he accepts their deal. Taito tries to talk to Himea again and make her regain control. Himea is able to talk to Taito, but the program goes crazy. Taito rejects the program, and Himea finally regains control. The two kiss, which is witnessed by Gekkou and Mirai, who have just returned. Himea realizes that Gekkou has made a deal with the Seraphim and tries to attack, but Gekkou is faster than her. He asks her if she knows about Ramiel Lilith (the name the Seraphim kept using). When she says no, he withdraws, revealing that the deal he had made was for the Seraphim not to bother them all. The episode ends with Haruka running into Hinata. So…everyone who was completely confused by this episode, raise your hand. Looks like Gekkou’s thinking the same thing I was. That battle last week was way too easy. Anyways, a love triangle has emerged with Taito having to deal with the supernatural Himea and the very normal girl Haruka (who both seem to have multi-colored hair for some reason). Also, school gets called off for the second half of the day and people are complaining? Are Japanese kids really that into school? While Himea and Taito head for the student council room, some weird bug things burst out of the room (Himea calls them dyltiklis). Also, one proceeds to take one of Taito’s seven lives (I would probably reset the save game at this point just because of how fail that death was). Gekkou then has a teacher explain that the school is actually a crossroads for many different worlds/dimensions. The worlds are connected by dimensional rifts, which can only be traversed by people under the age of 18 (ehh?). Because of that, the school has to rely on the student council to handle these things, and in return, the student council members can do whatever they want. It is later revealed that Gekkou used to have a good relationship with Hinata until one day when he arrives home to see that Hinata has killed their parents (OMG I knew Gekkou was Sasuke!!). Hinata tells Gekkou that he only has 9 years to live due to the contract he has made. However, 9 years later, Mirai appears before Gekkou to kill him, but is soundly beaten. Back in the present, Gekkou is attacked by a messenger from Hinata (I knew he was still alive), who tells him that he should stay away from Himea. The episode ends with a weird rain that kills Taito a couple of times. Yeah…if Gekkou and Hinata turn out to be Sasuke and Itachi all over again, I may have to kill myself. Hopefully, this series doesn’t end up like that. Also, this low quality is making me crazy…. This episode starts with a flashback where Taito remembers the day that he is separated from Himea. 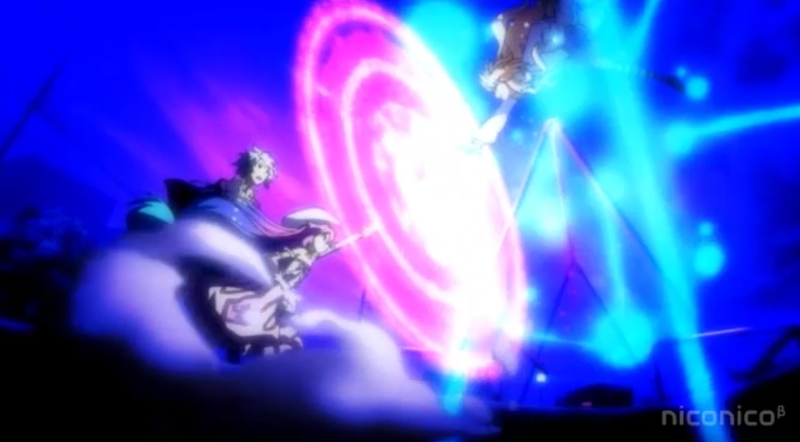 A strange boy named Hinata attacks Taito as he receives his power from Himea. It is revealed that the power is to prevent him from dying 6 times, resetting every 15 minutes. In order to save him from dying the 7th time, Himea agrees to go quietly with Hinata. Back in the present, Himea is being stabbed by Taito’s classmate Gekkou. A battle ensues until they are interrupted by the entrance of Hinata, who is revealed to be Gekkou’s twin brother (omg Gekkou is totally Sasuke). Gekkou and his partner Mirai, as well as Taito and Himea all team up to battle Hinata. After using up all 6 of his lives, Taito tries to make one final attack on Hinata and Hinata presumably dies (I think he’ll be back). The next day, Taito wakes up and realizes that he somehow survived. More importantly, Himea has transferred into his class. Hopefully this anime doesn’t turn out to be Naruto in a different setting, but we’ll see as we go along. The music is still pretty good, though. I just wish it didn’t only come out in 360p first. I want my HD!! So, a lot of new series have started this week, so I’m gonna give my preliminary thoughts on them. The first is Ro-Kyu-Bu. The protagonist, Hasegawa Subaru, is a former basketball player who is convinced by his aunt to coach an elementary school girls basketball team. 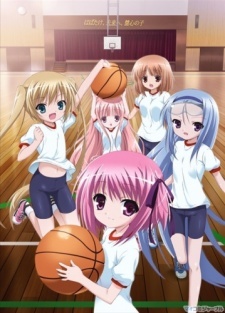 The members of this team are Tomoka Minato, an experienced basketball player, Maho Misawa, an energetic girl, Airi Kashii, a shy girl who looks older than she really is and is incredibly sensitive of that, Saki Nagatsuka, presumed to be the smart one of the group (because of the glasses), and Hinata Hakamada, who acts very polite and a tad naive. So after seeing the first two episodes, I’m a little wary of a loli relationship popping up between Subaru and Tomoka. So far, it’s been a pretty cute story, though. We’ll see how it turns out. Next, we have Kamisama Dolls. The protagonist, Kyouhei, moves out of his hometown to work in Tokyo. After drinking quite a bit one night, he and his friend Shiba find a dead body in an elevator. However, Kyouhei can’t help thinking the way of death is a little familiar. 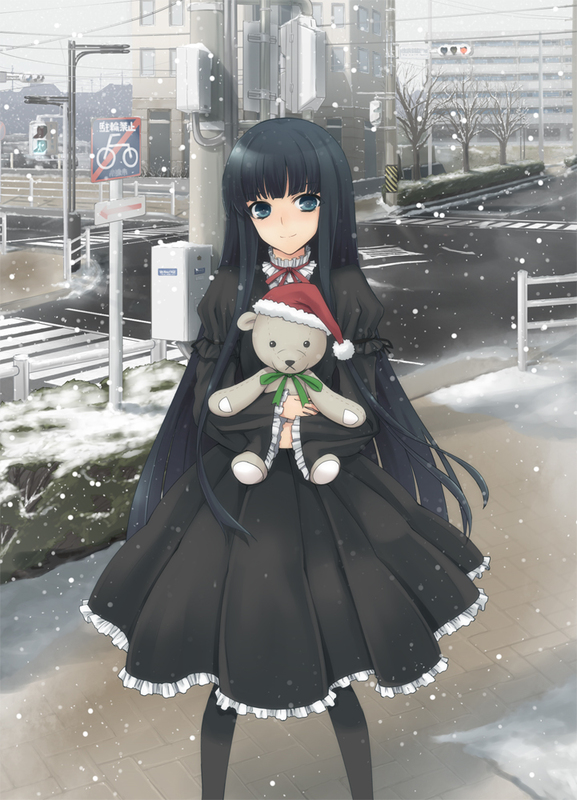 When he gets home, he runs into his sister Utao, who has followed him to the city with her “Doll”. The Dolls are believed to be some sort of god that can fight for them. However, another acquaintance of Kyouhei’s named Aki appears with his own Doll. It turns out Aki is responsible for the dead guy in the elevator, having broken free of his imprisonment at Kyouhei’s hometown to follow Kyouhei to Tokyo and wreak havoc. I have to say, the concept of this series is pretty interesting and I look forward to seeing where it goes. It will definitely be interesting to see if Kyouhei helps to fight Aki or if he just relies on Utao. Next up we have Mawaru Penguindrum. This anime kind of made me go “what the heck?” when I saw it. The story centers around three siblings, Kanba, Shouma, and Himari . Himari is very sickly, so the other two tend to take care of her. While at the aquarium, Himari collapses, and after being rushed to the hospital, dies. However, while the two brothers are grieving, she suddenly gets up from her bed, having come back to life somehow. A miracle, right? But as Yuko always says, there has to be equal compensation to grant a wish. The next day, a box arrives filled with ice and three weird blue objects frozen within it. You guessed it, they’re penguins. One penguin for each of the siblings, and only they can see them. These penguins help around, doing things like cooking or grabbing forgotten items. 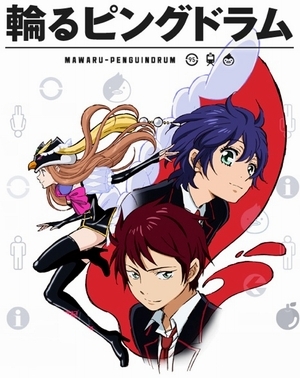 The siblings find out that in return for their sister’s life, they must find the Penguindrum….weird. This series has a pretty crazy concept, but the penguins are pretty cool and it looks like it will be good. Guess there’s only one way to find out. Still quite a few to go, but I’m gonna go through the next couple pretty quickly. First up, we have Ikoku Meiro no Croisee. This series actually takes place in Paris. A girl, Yune, comes to Paris to learn more about Western society. She stays with Claude, who owns an ironwork shop. This anime was pretty cute…I kind of threw me off because you could never tell if someone was speaking actual Japanese or if they’re speaking “French”. Next up, we have Mayo Chiki. Sakamachi Kinjirou has a problem where he has a nosebleed if he’s touched by a girl, and will even pass out if they keep touching him. One day at school, he finds out that insanely popular butler of Suzutsuki Kanade, Konoe Subaru, is actually a girl who is pretending to be a male butler as a test to prove a woman can be a butler. This anime’s got a familiar feel to it and I’m interested to see how it will distinguish itself. Next up is The iDOLM@STER, which follows 13 girls who are on the path to becoming idols. The first episode only introduced the girls, and they have some unique personalities. It seems like a good one to watch. And next is Sacred Seven, which follows the story of Arma Tandoji. He is feared at school because of an incident in the past where he injured many people. However, one day a mysterious girl, Ruri Alba, arrives at his home to ask for his help. Although he refuses, he is thrown into the conflict, awakening his inner power. However, he cannot control this power well, until Ruri steps in and gives him her gemstone, allowing him to use his power to its fullest potential. I have high hopes for this anime (mostly because Arma has Lelouch’s face). Alma also looks like a power ranger when he transforms, which is pretty cool. Lastly of the short reviews, we have Yuru Yuri, which follows 4 middle school girls in their…well, life. Basically similar to Lucky Star or K-On!, but with its own approach to the idea. Decent comedy. Next up, we have Itsuka Tenma no Kuro Usagi. Taito, the protagonist, finds himself having dreams, all of which have the same girl in it. However, he shrugs this off and tries to go on with his school life as usual. However, on the way home one day, he is run over by a truck. However, strangely, he doesn’t die. At this point, he remembers the girl from his dream as a girl from his past named Himea Saito, and runs off to find her. Their reunion is not the happiest of reunions, though…Because Himea is a vampire, this anime seems to have a Rosario + Vampire feel to it. I’m not sure what to expect yet, but it seems to be kicking off with some action as you will see from the first episode. Finally, we have Kamisama no Memochou. 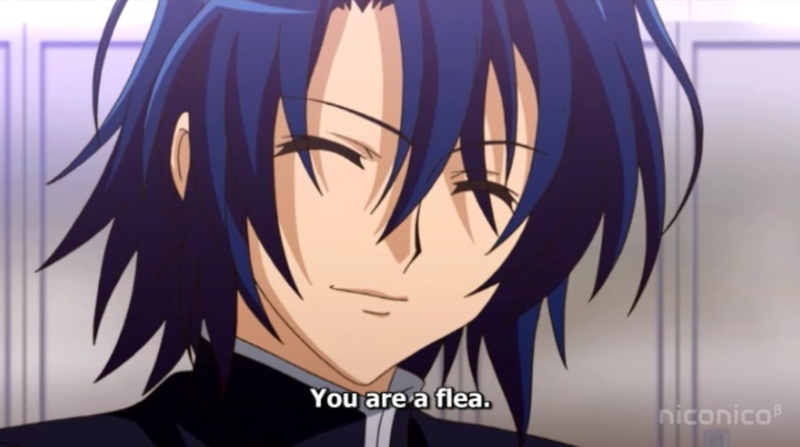 The protagonist of this anime, Narumi Fujishima, is a rather bland guy who doesn’t like to draw attention to himself. One of his classmates, Ayaka Shinozaki, notices him, though, and invites him to join the Gardening Club with her. Later, she takes him to meet Alice, a detective who solves cases without leaving her home. Narumi is suddenly thrown into the case, dealing with a missing girl. After he helps solve the case, Alice decides to hire him as an assistant. This anime definitely looks sweet. It’s also a 40 minute long episode O.o. But yeah, it was interesting. Reminded me a bit of Detective Conan, but less childish. There were a few more series that I watched, but they were either 5 minute long episodes, or it was Blade, which wasn’t that impressive. This was definitely a long one, and I’ll probably add in pictures later so it’s not just a huge block of text. Looking forward to this season!